Sometimes getting away together is a tall order for me and my Hubbin! In fact, we have not gone anywhere in some time. So what we often do instead is take a short half day or one day chunk of time and go somewhere close by. Today was one of those half-days and we decided to go to Old Town. This is the old, original center of Albuquerque which was first settled in the early 1600’s and officially founded as Villa de Albuquerque in 1706—making it over 300 years old. We definitely deserve to call this part of the city “Old Town!” It’s very quaint and full of shops and the area is designed in the Spanish tradition with a central plaza where the city hosts many fiestas throughout the year. In a matter of minutes we can drive to the heart of Old Town and we are transported to an entirely different environment than home. 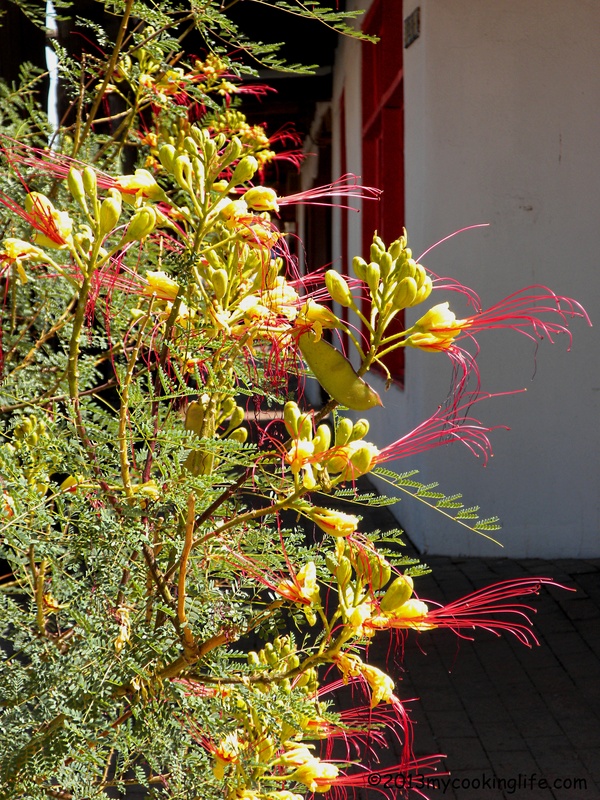 This Desert Bird of Paradise caught my eye on this very sunny morning in Old Town. 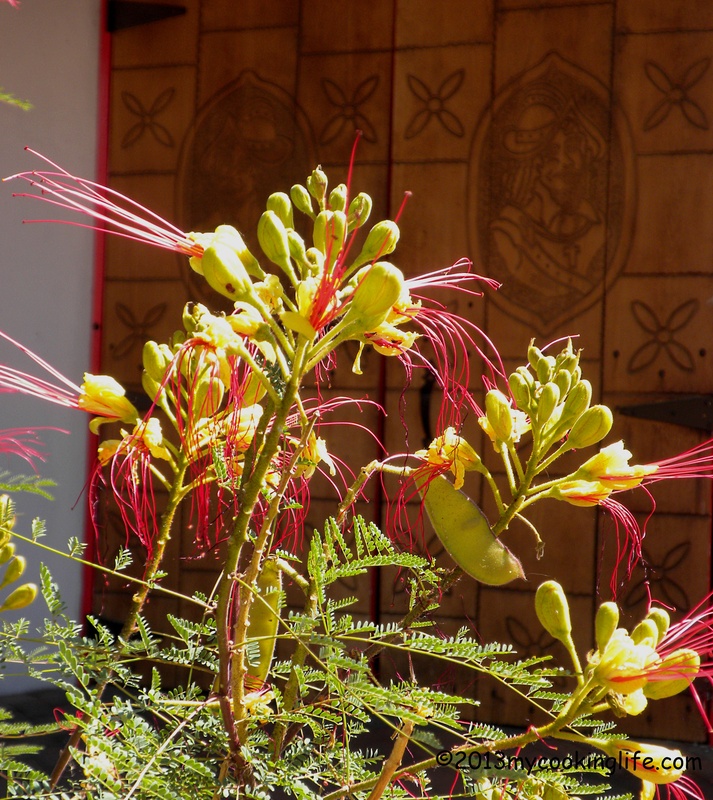 Another view of Desert Bird of Paradise against the backdrop of this beautiful old Spanish-style door. We found our way through the bright and colorful alleyways full of shops, galleries and eateries to a place I’d eaten at once before called, “BeBe Cafe.” I had gone there for lunch with out-of-town friends and really enjoyed a vegan panini sandwich with salad and some of the best coffee I’ve ever had. BeBe Cafe features European and French cuisine and everything is made from fresh, sometimes organic ingredients and prepared to order. 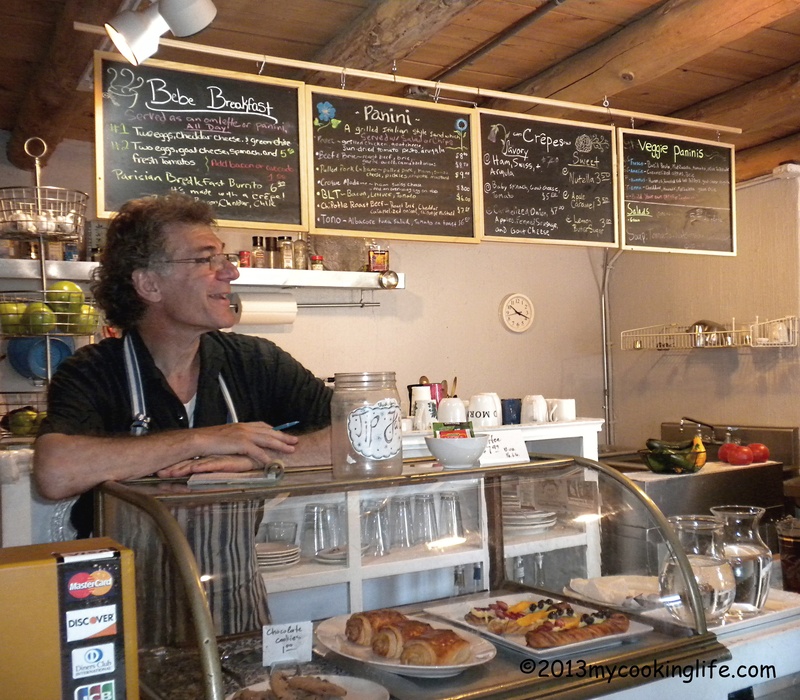 BeBe Cafe at 206 1/2 San Felipe NW, in Old Town was our destination this morning. We went in and ordered breakfast. I had a spinach and tomato crepe with watermelon and strawberries on the side. Hubbin’ had a bacon and egg crepe. The crepes were exquisitely thin and light! We shared an incredible freshly made French Danish with the lightest creme filling you can imagine and wonderul berries and papaya on top. The flavors were tres mervellieux and there was not enough sugar in it to distract. We only paid just over $20.00 for both breakfasts and our beverages. My best (and very cute) breakfast companion ever! And a big cup of coffee. You’d think I’d take pictures of this beautiful food that I said was so wonderful. But no, I didin’t because at the time I was more interested in my breakfast date with Hubbin’ and in devouring the wonderful food. But I did take another picture of the cafe including our new friend, Efthimios Maniatis, who made us our breakfast this morning. 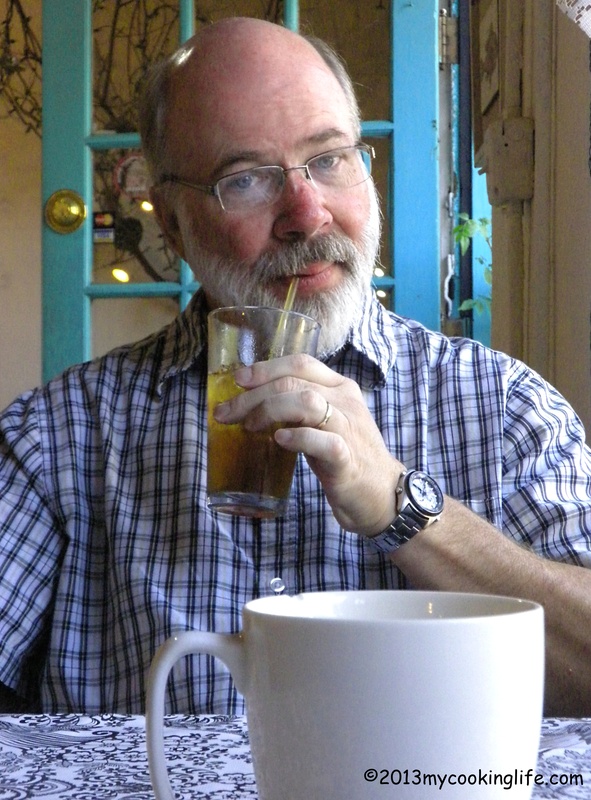 Efthimios is a local architect who also teaches at the University of New Mexico. He and his work is featured this month in Dwell magazine. You should see the lovely outdoor patio area he designed for the restaurant! We finally wandered out of BeBe Cafe feeling very pleased and satisfied with our breakfast and headed for the Albuquerque Museum nearby. It was a lovely morning! 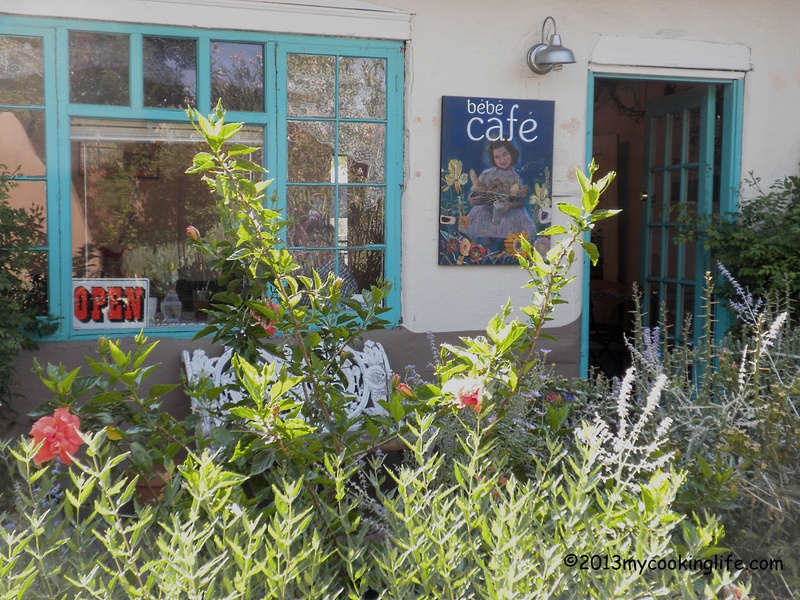 This entry was posted in New Mexico, Places to visit in New Mexico and tagged BeBe Cafe, Crêpe, French cuisine, Old Town Albuquerque, recommended restaurants in Albuquerque by mycookinglifebypatty. Bookmark the permalink. Oh what a nice post, Patty! I would love to have a breakfast (lunch, dinner) in Old Town. Visited it several years ago with my friend, Melinda, when we met here before heading north. I enjoyed that you showed your husband’s pic. Say, is there a picture of my pen pal anywhere on the blog…? Thank you. We will have breakfast in Old Town if you ever get to visit Kathy! I don’t put my own face on it too often but I did put a rather awful one on one of those beet posts. Please provide a link, lol! What a perfect date! What a name: Efthimios Maniatis! It’s like a storybook name! Just checked out the Dwell article and my my but that house is stunning. Totally loved this post Patty – thanks for sharing. You’re welcome, Azita! The date was lovely, if short! That name is a mouthful, isn’t it? He is Greek and if you google him you’ll see some very interesting “chats” with Efthimios who has a lovely philosophy about life. This is was a great morning that ended way too early!! One of the best places to visit. I enjoyed all my visits to New Mexico. Yes it’s a very friendly place with great food! Thanks for commenting, Jovina! Ah, I’ve only been to Albuquerque once an fully loved the food. It’s good to see you and Jack again.